Every homeowner knows that smoke detectors are crucial, but do we really utilize them to the fullest degree? The National Fire Protection Association estimates that 890 lives could be saved each year if all homes had working smoke alarms. This number is drastically lower than the number of deaths caused by home fires before smoke alarms were required in every home, but it is still too high considering the advanced technology we have to prevent fire deaths today! Keep reading to learn some basic tips about smoke alarm usage and routines to keep your home safe for years to come. Unsurprisingly, most deadly house fires occur when everyone is asleep. If your family sleeps behind closed doors, it is important to install a separate smoke alarm in every bedroom. This ensures that no one sleeps through the sound of more distant alarms or the smell of smoke. If anyone in your family is hard of hearing, you should install alarms that also flash bright light so they can be alerted visually. To avoid nuisance alarms from normal smoke and steam, don’t install the detector in close proximity to your stove or your bathroom. At the same time, avoid placing them by windows, doors, and air ducts, which can keep hem too ventilated and interfere with their operation. Depending on how much control you have over the installation process, opt for interconnected fire alarms that trigger the entire network to go off when one sensor is triggered. If we said that checking our smoke detectors was easy to remember in our busy day-to-day lives, we’d be lying. That’s why it’s best to make it easy for yourself and just set a reminder on your mobile device reminding you to test your alarm system once a month just to make sure everything is in working order. Batteries in your smoke detector need to be changed once per year. This not only ensures that your alarm should always have battery power, but it will prevent the dreaded “chirping” noise that comes when smoke detectors have dying batteries. Every 10 years, the smoke alarms themselves should be replaced. An easy way to keep track of this is to keep a sticker on the back of the battery cover with the replacement date written on it, so you’re reminded each month of when you’ll need to replace your smoke detectors. Have you developed and practiced a home fire escape plan with your family? Don’t feel bad if you haven’t – only 26% of families have, according to the American Red Cross. Regardless, this is an important tip to take from the home fire prevention experts. All a smoke detector does is alert you to the presence of a fire. From there, it is up to you to get out of your home safely. Panic can seriously impede safety measures and waste precious minutes in an emergency, so it is imperative for your family to have a plan in place and know exactly what to do if your home catches fire. 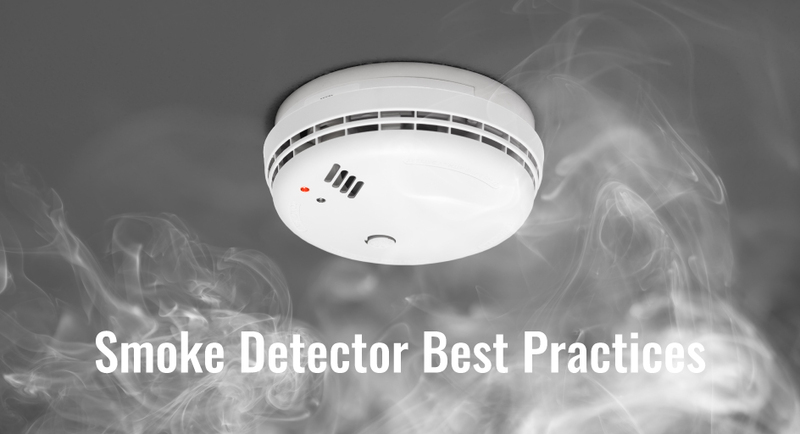 Some types of smoke detectors can reduce your home insurance premium cost. This mostly applies to central monitoring systems that connect to emergency services and alert the authorities when the system is triggered. These are particularly useful for homeowners who travel a lot, but they are a great safety option for anyone to have. However, these systems cost more than the average smoke detector. Ask your independent agent if a home insurance discount could help offset the cost of a central monitoring system!